Rocambole garlics tend to have thinner bulb wrappers than other hardnecks and lots of purple striping and splotches. They are not as white as other hardnecks and have a brownish cast to them, in fact, some of them almost look as though they need a bath. What they lack in beauty, they make up for in taste. Other rocamboles have sharp, vivid colors that alert the consumer to their strong, rich and deep flavor. 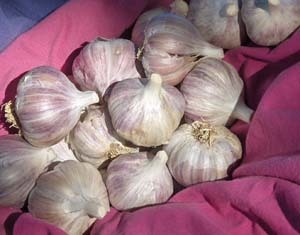 Many people consider them their favorite garlics because of their very rich taste. In the spring they send up a scape (stalk) that forms a complete double loop. (They're the only garlics that do a double loop.) They have usually eight to ten cloves arranged in circular fashion about a central scape and have few or no smaller internal cloves. They do not grow well in warmer climates. They require a colder winter and a cooler spring than we have in most states south of Ohio. Warm winter denizens can and should buy them to eat because they're great. They more than make up for any of their shortcomings with their flavor. Did I mention flavor? Their flavor must be experienced to be believed - its depth is remarkable. They have a deep earthy muskiness about them that few other garlics have and most are fiery when eaten raw though there are a few mild ones.